This is a companion article to “The Stages of Change: Gluten-Free Edition.” I started out writing Gluten-Free Success, but a quote from Vishwas Chavan sent me down a rabbit hole about how we process and deal with change. Thank you for riding along with me on this trip. How can we even begin to think about success when we're wondering how to survive breakfast? 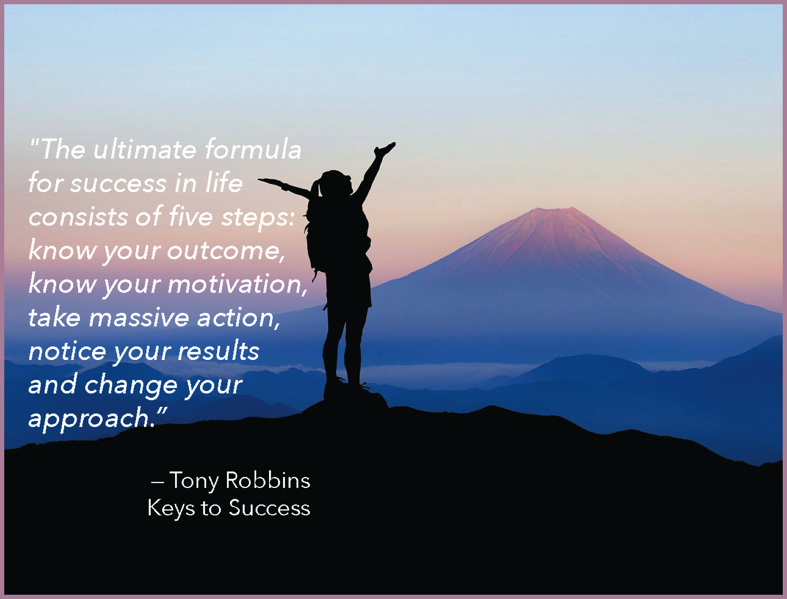 If you hadn't heard of Tony Robbins, he's is a motivational speaker, author, and famous life coach. I find his formula for success straightforward and commonsensical. I like that. I'm all about being sensibly gluten-free. While it may happen to some, most people don't blindly stumble into success - particularly with something significant like a lifestyle change. It usually requires some conscious effort - "massive action" as Mr. Robbins calls it. Let's look at Mr. Robbin's formula and see how it can help create a successful gluten-free life. There are many definitions of success, but the best one is the one you've created for yourself. Success is unique - as individual as a fingerprint. One person’s success may be another person’s failure. Whether a newbie or a pro at the gluten-free lifestyle, ask yourself, "What does my success look like?" Let your answer be your guide. If you've been suffering from an undiagnosed gluten-related disorder, you probably know your outcome already. An excellent long-term success goal, but don't forget to develop a roadmap - a plan to get there. Gluten-free success may be different depending on the day, the hour, or even by the minute. That split moment decision to pass up that piece of gluten-filled birthday cake, the time spent learning what gluten is, or becoming a label reader and finding hidden gluten, helping someone in the gluten-free aisle at the grocery store are all great examples of success. On the surface, some of them might seem insignificant to us, but if we examine them closely, they are important milestones. Those successes add up and contribute to our long-term success goal. Motiviation is "The Why You Do it". That little voice inside you - sometimes whispering - other times SCREAMING that you can do it. Knowing what pushes you forward enables you to be more effective in attaining your success. For many, the motivation is a better life without the constant pain and suffering. For some, it's centered around loved ones - having the ability to fully present for them. For others, it's the opportunity to help others. Spend some time figuring out what gets your mojo working...and keep working it. Transitioning to the gluten-free lifestyle is filled with numerous distractions; things that will pull you into the weeds. Friends and family members who offer gluten-filled foods, "Donut Day" at work, birthday celebrations, family gatherings, holiday parties. These are just a few events where temptation is present. Enter stage left - discipline. Discipline is "The What You Do." It's the ability to analyze a situation and make corrections in your behavior. Discipline keeps you on the "straight and narrow"; preventing you from eating that [gluten-filled] donut or giving into friends and family members' offerings. Motivation and discipline work together. When the motivational inspiration wanes, discipline swoops in to save the day. It's true, you will experience low-motivational days. Probably more than you want, but this is normal. Expect it and prepare for it. Mental preparation will help get you through; stay positive. By focusing on those small (minute-by-minute, day-by-day) successes, you will help raise your motivational energy levels. There will be obstacles. There will be doubters. There will be mistakes. But with hard work, there are no limits. Making a lifestyle change is no small feat. You're re-wiring years [decades] of behaviors and habits. Unlearning your old way of life and replacing it with a brand new one requires a lot of hard work, dedication, and commitment. You've probably noticed the use of the word "lifestyle" instead of "diet." Changing what you eat is only one component. This change will affect every facet of your life from here on out. Convenience – gone. Care-free dining – adios. The joy of family gatherings - replaced with dread and worry. Things that took little or no thought - now rivals the logistics of a Mars Rover launch. Yes, it will require massive action. A few examples of massive action in the gluten-free lifestyle. Making the 24x7x365 commitment to gluten-freedom. There are no vacations, no breaks, no “just this once" cheats. Constant vigilance is required. Gluten never sleeps. Educate yourself about gluten - what is it, learn where and how to find it. Determine if you can have a gluten-free house. Many variables to consider. Choose what's best for you and your family. Clean your house from top to bottom. Crumbs matter. Either throw out all the gluten [and gluten-contaminated items] for gluten-free household or arrange [segregate] gluten-free/gluten products accordingly. Setup gluten-free safe zones and develop cross-contact policies and procedures [and make sure household members abide by them]. Educate your friends and family members. Depending on the family this task may be more Sisyphean than Herculean, but it needs to be done. Join and participate in a support group. Local face-to-face groups are best, but online groups can be beneficial too. The key word in this step is "change." Change isn't always linear with clearly defined starting and stopping points; it's an on-going, evolving process. Due to the complexity of this lifestyle, you will be making some mistakes in the beginning. Everyone does, it's all part of the process. You didn't go from crawling to walking without a few falls. Don't let these events derail your efforts. Get up, dust yourself off, and try again. Resiliency and adaptivity will take you far on your journey toward gluten-free success. The important take away here: learn from your mistakes. If you don't you will be spinning your wheels; expending a lot of energy but going nowhere - fast. When something didn't work out as you expected, or you are not feeling well, take time to analyze what has been happening, why it's happening, and how you can prevent it in the future. Yes, you have to become a "Gluten Detective." Perhaps you've switch products because the store stopped carrying your first choice? Maybe the french fries you ordered at the restaurant were fried in the same fryer as the gluten-full items? What about overlooking gluten in a product's ingredient list? Only those who are able to adapt to changing scenarios will continue to survive and prosper. Success is directly proportional to the degree of positive adaptation to change. I understand that our health may not always be under our direct control, but I also know that before tackling any challenge, we must first prepare ourselves mentally. Hopefully, the information presented here and in the Stages of Change article will help increase your knowledge, grow your confidence, and elevate your capacity to manage the jumble of emotions you'll experience on this gluten-free journey. Here’s to your success! Cheers!